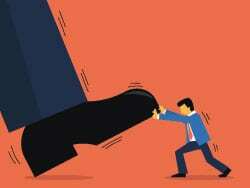 Demographic change means that companies today are facing a previously unknown challenge: the battle over the best employees. Only companies that are able to keep good employees are able to increase productivity, grow and survive amid the competition. But the very employees they are in search of, the young “Generation Y”, have become choosy. A commensurate salary and good career opportunities go without saying. A comparative study of the years 2004 and 2014 by the Centre of Human Resources Information Systems of the University of Bamberg established that Generation Y placed particular importance on soft factors such as work climate (2004: 53%, 2014: 94.3) flexible hours 2004: 28%, 2014: 85.9) and work/life balance (2004: 27%, 2014: 67.9%) when choosing an employer. The location of the company and the office spaces are also of particular importance. Generation Y no longer wants to qualitatively differentiate between leisure and work areas of life. Work is a part of life and should match the employee’s personal lifestyle. It is for this reason that preference is given to central company locations and excellent infrastructures as well as good road connections. Offices have to be equipped not only to a technically modern standard but also offer showers for cyclists, informal communication zones, a healthy indoor climate, places of retreat and in the best case scenario it would also offer fitness options for the lunch break. The real estate company operating across Europe, CA Immo, recognised this trend early on. It was through inner-city large-area urban quarter developments in Germany that the company was able to achieve the prerequisites of such urban locations. In Frankfurt’s Europaviertel (European quarter), CA Immo has most recently not only completed Germany’s fourth highest office building, Tower 185, but also heralded in a new generation of high-rise. It has a correspondingly self-assured motto: the Next Generation of High-rise. Tower 185 is one of the first high-rises in Europe awarded Gold certification for Leadership in Energy and Environmental Design (LEED) from the U.S. Green Building Council. It conserves valuable natural resources and protects the environment in a variety of innovative ways. Green buildings have a wide range of benefits – and not just for the environment: they offer greater efficiency, provide improved indoor environmental quality and help create a positive business image. The distinctive driveway and Mediterranean style plaza in front of Tower 185 creates an excellent first impression. The attractive restaurants and cafés under the archways invite visitors to relax and browse. The reception, located in the striking, 19-metre-high entrance hall, offers a central point of contact for tenants and visitors. 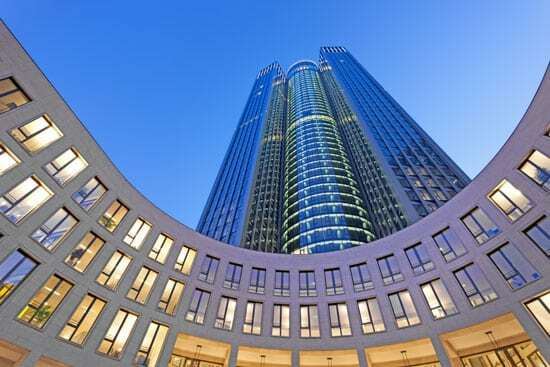 The tower’s central location is also beneficial in this respect – the Westend area of Frankfurt has a wide range of restaurants and hotels as well as highly respected schools and childcare facilities, including international ones. Tower 185 offers convenient links to key locations across the city – from one of Frankfurt’s most important business hubs. The Festhalle/Messe underground stop is just in front of the building. The bustling central train station is just five minutes away by foot, and the airport can be reached in fifteen minutes by car or public transport. And also Frankfurt international trade fair is just a stone’s throw away from Tower 185. Many well-known international companies, such as the financial auditing and consulting company PwC (PricewaterhouseCoopers), the law firms Mayer Brown LLP and Dechert LLP, Hyundai Capital Europe, CBRE Global Investors and the Frankfurt Branch of Australia New Zealand Banking Group (ANZ Bank) have already been convinced by this concept.